CrowdTwist is a cloud-based customer loyalty platform and engagement marketing solution for businesses of all sizes, which aims to drive engagement and loyalty by providing users with the tools to create personalized, omnichannel experiences using predictive analytics and visitor data. Designed to help brands enhance relationships with their customers and retain clients in the long-term, CrowdTwist allows users to create incentive programs using data gathered from behavior tracking. Businesses can use the CrowdTwist platform to incentivize their customers in order to encourage loyalty and engagement, with tools for tracking and rewarding behavior. A range of different spend and engagement behavior types can be tracked, including reading a blog or article, making a purchase, writing a review, referring a friend, following the brand on social media, and more. The built-in predictive analytics automatically gather data on website visitors and convert this data to deliver personalized, targeted content with the aim of converting or retaining these visitors. CrowdTwist uses a rewards system to retain and engage customers, and to help build deeper relationships with existing customers. Brands can create and deliver a benefits program to clients, and can segment their customers into groups based on demographic, behavior, purchase history, and other metrics, in order to deliver personalized benefits and rewards. CrowdTwist’s predictive algorithms can identify and create these audience segments based on historical and real-time data. Features such as gamification, points systems, personalized discounts, and more aim to encourage loyalty by targeting customers with rewards that are relevant to them and their purchase trends. There are currently no reviews of CrowdTwist. Contact CrowdTwist for pricing information. 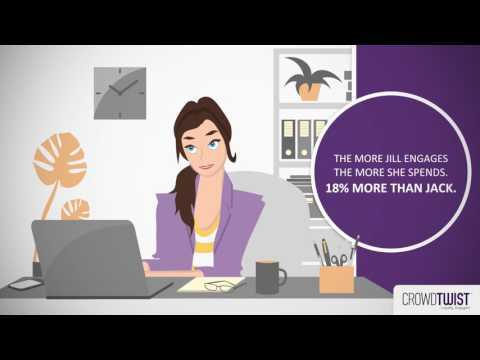 Utilize CrowdTwist’s loyalty tools to engage and retain existing customers. Incentivize clients for carrying out activities such as reading a blog post, writing a review, scanning a receipt, referring a friend, following on social media, and more. Allow CrowdTwist to automatically capture and connect data across multiple touchpoints in order to better understand website visitors and provide a personalized omnichannel experience. Benefit from CrowdTwist’s predictive analytics which leverage machine learning to create customer segments and deliver relevant, personalized experiences to customers. Integrate with a range of third party platforms including social media sites such as Facebook, Twitter, and Instagram, as well as CRM systems, gift card and experience providers, and more. Build profitable and active relationships with customers and deploy incentives to drive increases in high value behavior and spend, while simultaneously developing a proprietary data asset. Below are some frequently asked questions for CrowdTwist. Q. What type of pricing plans does CrowdTwist offer? Q. Who are the typical users of CrowdTwist? Q. What languages does CrowdTwist support? Q. Does CrowdTwist support mobile devices? Q. Does CrowdTwist offer an API? No, CrowdTwist does not have an API available. Q. What other apps does CrowdTwist integrate with? Q. What level of support does CrowdTwist offer?